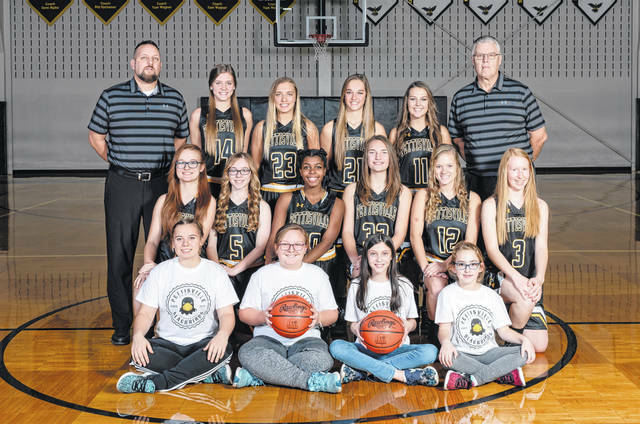 The 2018-19 Pettisville girls basketball team. The Pettisville girls basketball team almost always has a say in the race for the Buckeye Border Conference title. This season should be no different as the Blackbirds have four letter winners back, including three seniors. Returning for the Blackbirds is Morgan Leppelmeier who averaged 13.4 points and over five rebounds per game in 2017-18. She was the BBC Player of the Year, first team in District 7 and third team All-Northwest District in Division IV. They also return seniors Elizabeth Beck (second team All-BBC, honorable mention District 7) and Brandi Schnitkey, and junior Mikayla Graber. Newcomers to the squad are Jessica McWatters, Heather Sauder, Ellie Wixom, Elise Hartzler and Xavia Borden. However, they did lose three key contributors. Gone are Nichole Foor (6.5 ppg, 7.4 rpg), Sami Tilley (4.4 ppg) and Kendal Pursel (3.6 ppg). Foor was second team All-BBC and honorable mention in District 7, while Tilley was honorable mention in both the BBC and District 7. “Individuals will be finding new roles than they have played in the past and the lack of size,” said Waldvogel of potential weaknesses for his squad. Pettisville will be looking to dethrone Stryker this season. The Panthers won the league title with a perfect 12-0 mark a season ago. They also return three girls who received all-league honors.